Indonesia has been independent since 1945 after having been the Dutch East Indies for more than 350 years. It is a huge country, stretching along both sides of the Equator for more than 46 degrees of longitude (roughly 5100 km or 3200 miles). Comprised of some 17,000 islands (more than 6000 inhabited islands), it has hundreds of major aids to navigation. This is one of five pages for lighthouses of Sulawesi (Celebes), a major island in the northern part of the country. Shaped like an artistically drawn letter K, Sulawesi consists mostly of four narrow peninsulas. The Strait of Makassar separates Sulawesi from Kalimantan (Borneo) to the west. The Celebes Sea is north of the island, the Banda Sea is to the east and southeast, and the Flores Sea is on the south. Makassar, also called Ujung Pandang, is the major port. This page covers South Sulawesi Province, which includes the well-populated southern peninsula and a large number of islands in the Flores Sea, Java Sea, and Strait of Makassar. The Indonesian word for a lighthouse is mercusuar. The phrase menara suar, which includes the Arabic word menara, is often used instead. Pulau is an island, tanjung or ujung ("end") is a cape or headland, karang is a reef, teluk is a bay, and pelabuhan is a port. 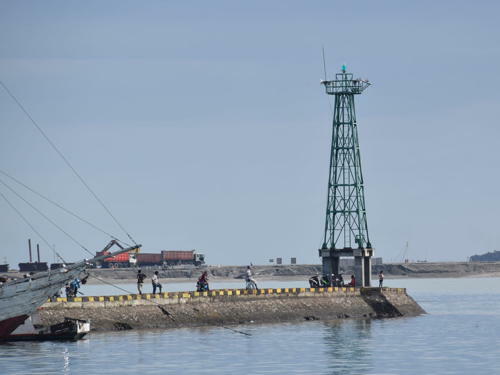 Aids to navigation in Indonesia are operated and maintained by the Directorate General of Sea Navigation. ARLHS numbers are from the ARLHS World List of Lights. Admiralty numbers are from volumes F and Q of the Admiralty List of Lights & Fog Signals. U.S. NGA List numbers are from Publication 112. Historic postcard views from the collection of Michel Forand. Note: The Gulf of Boni is a broad arm of the Flores Sea separating the southern and southeastern peninsulas of Sulawesi. The north and west shores of the Gulf are in South Sulawesi Province. 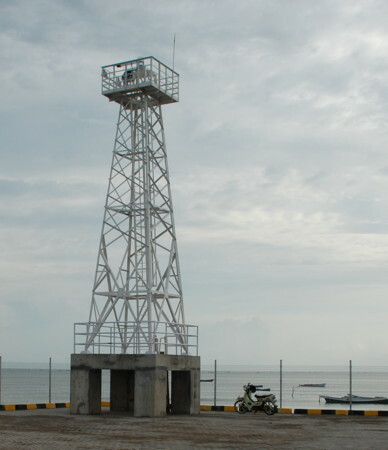 Lighthouses of the east coast of the Gulf are described on the Southeast Sulawesi page. Date unknown. Active; focal plane 18 m (59 ft); white flash every 3 s. Approx. 15 m (49 ft) "white beacon." No photo available; Bing's satellite view suggests a white fiberglass or concrete tower. Located at the east end of Pulau Bulu Bulu, a forested island projecting into the northeastern embayment of the Gulf of Boni. Accessible only by boat. Site status unknown. Admiralty Q1545.6; NGA 25400. Date unknown. Active; focal plane 10 m (33 ft); white flash every 5 s. 7 m (23 ft) round barbell-shaped white fiberglass tower. No photo available but Google has a satellite view. NGA lists a white mast for this light. Located at the southern tip of a small island in the entrance to Teluk Usu, a bay at the northeastern corner of the Gulf of Boni. Accessible only by boat. Site status unknown. Admiralty Q1545; NGA 25404. Date unknown. Active; focal plane 14 m (46 ft); white flash every 3 s. 8 m (26 ft) square skeletal tower, painted white and mounted on a square concrete base. Ishak Bocha has a 2017 photo and Google has a street view and an indistinct satellite view. Located at the end of the main quay at Palopo, a city of 150,000 residents at the northwestern corner of the Gulf of Boni. Site open, tower closed. Admiralty Q1544; NGA 25390. Date unknown. Active; focal plane 15 m (49 ft) (? ); white flash every 5 s. 20 m (66 ft) square white skeletal tower mounted on a platform supported by piles. No photo available but Bing has a distant satellite view. Located off a swampy point of land about 30 km (19 mi) southeast of Palopo. Accessible only by boat. Site open, tower closed. Admiralty Q1542; NGA 25388. Date unknown. Active; focal plane 34 m (112 ft); white flash every 10 s. 30 m (98 ft) octagonal skeletal tower with lantern and gallery, painted white. No photo available but Google has a satellite view. Located on a low point of land on the central west coast of the Gulf of Boni, about 45 km (28 mi) north of Macoppe. Site status unknown. ARLHS IDO-306; Admiralty Q1541.3; NGA 25473. Date unknown. Active; focal plane 8 m (26 ft); red flash every 4 s. 8 m (26 ft) square skeletal tower mounted on a square platform supported by piles. Google has a street view and an indistinct satellite view. 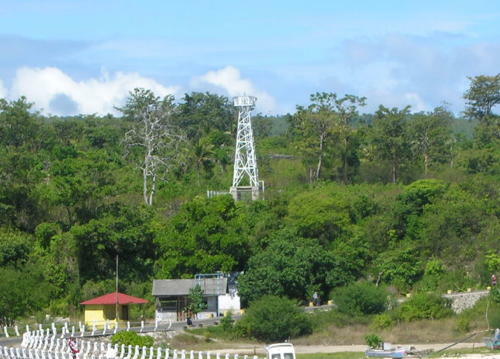 Bajoe is the port for Watampone, a city of 80,000 residents that is the capital of Bone Regency. Located at the ferry terminal at the end of the long pier of Bajoe. Site open, tower closed. Admiralty Q1540.9; NGA 25470.5. Date unknown. Active; focal plane 15 m (49 ft); white flash every 3 s. 15 m (49 ft) square white skeletal tower mounted on a square platform supported by piles. No photo available but Bing has a distant satellite view. This light guides ships around a very large area of shoals and reefs in the southwestern Gulf of Boni. Accessible only by boat. Site open, tower closed. Admiralty Q1540; NGA 25470. Note: The Selayer Islands extend south and then southeast into the Flores Sea from the southeastern tip of Sulawesi's Southern Peninsula. Pulau Selayer, a long island extending north and south, is the largest and northernmost of the islands. Date unknown (station established 1898). Active; focal plane 65 m (213 ft); four white flashes every 20 s. 20 m (66 ft) square skeletal tower with lantern and gallery. Lighthouse painted white, lantern red. Several coast guard buildings. A photo is at right and Google has a satellite view of the station. The original lighthouse had a focal plane height of only 45 m (148 ft), so it must have been built at a lower location. 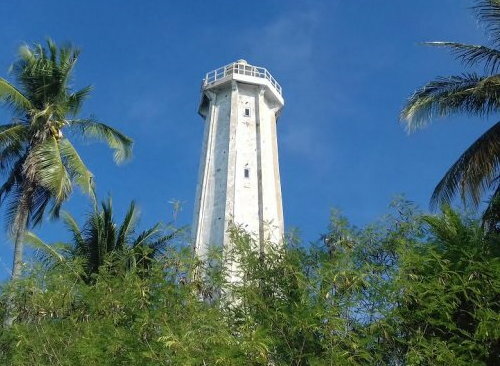 The lighthouse marks the narrow Selayer Strait separating the Selayer Islands from Tanjung Bira, the southern tip of Suluwesi. Located on a small island off the northern end of the much larger island of Selayar, about 30 km (19 mi) southeast of Bulukumba. Accessible only by boat. Site status unknown. ARLHS IDO-234; Admiralty Q1536; NGA 25408. Date unknown. Active; focal plane about 30 m (98 ft); light characteristic unknown. Approx. 15 m (49 ft) square skeletal tower with gallery, painted white. Taufik Hidayatullah's photo is at right, and Google has a satellite view. Located at the ferry terminal at Pamatata, on the northeast coast of Pulau Selayer. Site open, tower closed. Date unknown. Active; focal plane about 15 m (49 ft); white light, characteristic unknown. Approx. 12 m (39 ft) square skeletal tower, painted white and mounted on a square 1-story equipment shelter. Swas Harimurti has a photo and Google has an indistinct satellite view. Located on the waterfront at Benteng, the regency capital and ferry port on the central west coast of Pulau Selayer. Site open, tower closed. Admiralty Q1538. Date unknown. 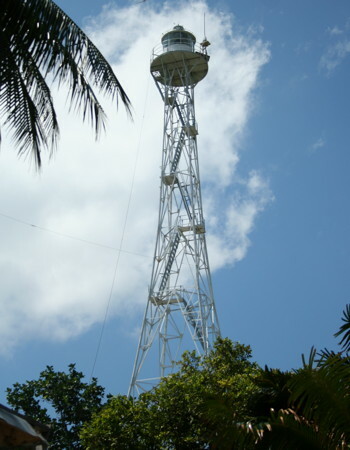 Active; focal plane 16 m (52 ft); white flash every 5 s. 10 m (33 ft) round barbell-shaped white fiberglass tower. No photo available but Bing has a distant satellite view. This light warns ships away from a large area of reefs and shoals east of Pulau Selayer. Located on a small island about 80 km (50 mi) east of Pulau Selayer. Accessible only by boat. Site status unknown. Admiralty Q1327.2; NGA 25662.2. Date unknown. Active; focal plane about 17 m (56 ft); white light, pattern unknown. Approx. 15 m (49 ft) square white skeletal tower with gallery mounted on a concrete base supported by piles. A distant view is available (3/4 the way down the page) and Bing has a satellite view. Located at the ferry terminal at the west end of Pulau Jampea, a large island about 65 km (40 mi) south of Pulau Selayer. Site open, tower closed. Admiralty Q1327.55. Date unknown. Active; focal plane 11 m (36 ft); white flash every 5 s. Approx. 10 m (33 ft) "white beacon." No photo available; Google's distant satellite view suggests a white fiberglass tower. Located at the southeastern tip of Pulau Jampea. Site status unknown. Admiralty Q1327.5; NGA 25662.5. Date unknown. Active; focal plane 64 m (210 ft); three white flashes every 10 s. 30 m (98 ft) square skeletal tower, painted white. Several coast guard station buildings. No photo available but Bing has a satellite view of the station. Located on the southwest side of Pulau Bonerate, an island in the Flores Sea near the southeastern end of the Selayer group. Site status unknown. Admiralty Q1328; NGA 25663. Date unknown. Active; focal plane about 15 m (49 ft); red light, characteristic unknown. Approx. 12 m (39 ft) square skeletal tower, painted red and mounted on a platform support by piles. Ardi Suhardi has a photo, but the tower is not seen in Bing's satellite view. Located off the pier at Bonerate harbor, on the west side of the island. Not listed by the Admiralty. Date unknown. Active; focal plane about 16 m (52 ft); white light, characteristic unknown. Approx. 12 m (39 ft) square skeletal tower, painted white and mounted on a platform support by piles. Sandas Block has a distant view (the tower is seen just to the right of the yellow waterfront building), and Google has an indistinct satellite view. Located on the waterfront at Bonerate harbor. Not listed by the Admiralty. Date unknown. Active; focal plane 12 m (39 ft); white flash every 2 s. 12 m (39 ft) round barbell-shaped white fiberglass tower mounted on a concrete platform supported by piles. A 2018 photo is available and Google has a satellite view.Located on the beach near the south end of Pulau Raja, a small inhabited island about 25 km (15 mi) north of Pulau Bonarate. Site open, tower closed. Admiralty Q1327.7; NGA 25664. Date unknown. Active; focal plane 11 m (36 ft); white flash every 2 s. 10 m (33 ft) round white fiberglass tower. No photo available, but Google has a distant satellite view. Located near the south end of Pulau Kakabia, an uninhabited island at the extreme southeastern end of the Selayer group. Accessible only by boat. Site status unknown. Admiralty Q1328.5 NGA 25666. Note: Bulukumba is a city of about 80,000 residents at the end of Sulawesi's southern peninsula. Date unknown. Active; focal plane about 15 m (49 ft); red light, characteristic unknown. Approx. 12 m (39 ft) square skeletal tower, painted red and mounted on a platform support by piles. Google has a street view and an indistinct satellite view. Located just off the end of the south breakwater at Bira, a ferry port at the southeastern tip of Sulawesi's southern peninsula, opposite Pulau Selayer. Accessible only by boat but easily seen from nearby. Site open, tower closed. Admiralty Q1534. Date unknown. Active; focal plane 13 m (43 ft); white flash every 5 s. 10 m (30 ft) round barbell-shaped white fiberglass tower. Heru Purwanto's closeup photo is at right and Google has a street view and a satellite view. Located adjacent to the ferry terminal in Bulukumba. Site open, tower closed. Admiralty Q1532.5; NGA 25411. Date unknown (station established 1904). Active; focal plane 26 m (85 ft); four white flashes every 20 s. 24 m (79 ft) sqaure skeletal tower with lantern and gallery, painted white. Google has a street view and a satellite view. The original tower had a height of 13 m (43 ft). Located on a promontory on the southwest side of Bulukumba. Site status unknown. ARLHS IDO-121; Admiralty Q1532; NGA 25412. Date unknown. Active; focal plane about 13 m (43 ft); light characteristic unknown. Approx. 12 m (39 ft) square skeletal tower with gallery, painted white, mounted on a square concrete base supported by piles. Asrul Noer's photo is at right, and Google has a street view and a satellite view. Located at the base of a long pier at Bantaeng. Site open, tower closed. Not listed by the Admiralty. Date unknown. Active; focal plane about 15 m (49 ft); light characteristic unknown. Approx. 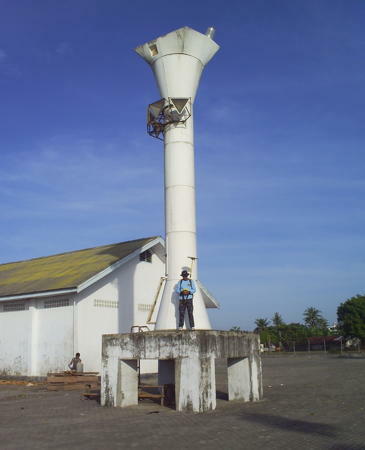 15 m (49 ft) round barbell-shaped white fiberglass tower mounted on a concrete platform supported by piles. No photo available but Google has a satellite view. Located on the east side of the entrance to the bay of Jeneponto. Accessible only by boat. Site open, tower closed. Admiralty Q1531. Date unknown. Active; focal plane about 13 m (43 ft); light characteristic unknown. Approx. 12 m (39 ft) square skeletal tower with gallery, painted white, mounted on a square concrete base supported by piles. Aswin Bahar has a photo and Google has a street view and an indistinct satellite view. Located near the base of a long pier at Jeneponto. Site open, tower closed. Admiralty Q1530. Date unknown. Active; focal plane 42 m (138 ft); white flash every 10 s. Approx. 40 m (131 ft) square skeletal tower with lantern and gallery, painted white. Several coast guard station buildings. No photo available but Google has a satellite view of the station. Located at the southern tip of the Southern Peninsula near Binamu. Accessible by road. Site probably open, tower closed. Admiralty Q1528; NGA 25414. Date unknown. Active; focal plane 24 m (79 ft); white flash every 10 s. 20 m (66 ft) octagonal white concrete tower with lantern and gallery. No photo available but Bing has a satellite view. Pulau Tanakeke is a populated island about 15 km (9 mi) southwest of Patalasang, on the southwestern tip of Sulawesi. Located at the southern tip of the island. ARLHS IDO-250; Admiralty Q1518.5; NGA 25421. Date unknown. Active; focal plane about 16 m (52 ft); light characteristic unknown. Approx. 16 m (52 ft) square white skeletal tower mounted on a platform supported by piles. No photo available but Google has a satellite view. Located off the east coast of Pulau Tanakeke. Accessible only by boat. Site open, tower closed. Admiralty Q1519; NGA 25422. Date unknown (station established 1893). Active; focal plane 42 m (138 ft); white flash every 5 s. 30 m (98 ft) square skeletal tower with gallery, painted white. Several coast guard station buildings. No photo available but Bing has a satellite view. The original lighthouse had a focal plane height of 32 m (105 ft). Located on a small island about 10 km (6 mi) northwest of Pulau Tanakeke. Accessible only by boat. Site status unknown. ARLHS IDO-196; Admiralty Q1518; NGA 25424. Date unknown. Active; focal plane about 16 m (52 ft); light characteristic unknown. Approx. 16 m (52 ft) square white skeletal tower mounted on a platform supported by piles. No photo available but Bing has a satellite view. Located west of Pulau Sangrabengi, a small island off the town of Galesong. Accessible only by boat. Site open, tower closed. Admiralty Q1518.3. Note: Makassar is the capital of South Sulawesi, by far the largest city of the island, and the fifth largest city of Indonesia; the metropolitan area has a population of about 2 million. Date unknown. Active; focal plane 41 m (135 ft); four white flashes every 27 s. 40 m (131 ft) square skeletal tower with lantern and gallery, painted white; lantern painted red. A photo is at right, Arham Muhammad has a 2012 photo (first photo on the page), a small photo is available (3/4 the way down the page), and Google has an indistinct satellite view. Located at the south end of a small but densely populated island about 15 km (9 mi) west of Makassar. Accessible only by boat. Site status unknown. ARLHS IDO-023; Admiralty Q1517; NGA 25432. Date unknown. Active; focal plane 15 m (49 ft); two green flashes every 5 s. 15 m (49 ft) square skeletal tower, painted white and mounted on a square platform supported by piles. Jim Smith's photo is at right and Google has an indistinct satellite view. Located at the north end of the reef surrounding Pulau Samalona, an islet about 8 km (5 mi) west of the Makassar waterfront. Accessible only by boat. Site open, tower closed. Admiralty Q1511; NGA 25436. 2018. Active; focal plane 15 m (49 ft); green flash every 3 s. 15 m (49 ft) square skeletal tower with gallery painted green. No photo available but Google has a satellite view. This light replaced a round barbell-shaped tower, which was still present when Jim Smith visited in January 2019 but probably will be removed. The entrance to the harbor of Makassar is through a narrow opening in a fringing reef that protects the port from storms. Located on the south side of this entrance. Accessible only by boat. Site open, tower closed. Admiralty Q1514; NGA 25448. 2018. Active; focal plane 15 m (49 ft); red flash every 4 s. 15 m (49 ft) square skeletal tower with gallery painted red. No photo available but Google has a satellite view. This light replaced a round barbell-shaped tower, which was still present when Jim Smith visited in January 2019 but probably will be removed. Located on the north side of the harbor entrance. Accessible only by boat. Site open, tower closed. Admiralty Q1513; NGA 25444. Date unknown. Active; focal plane 32 m (105 ft); white flash every 3 s. Triangular skeletal tower, painted red with a white horizontal band, mounted atop a waterfront building. Aswn Bahar has a 2016 photo and Google has a satellite view. Located at the south end of the main quay of Makassar harbor. Site open, tower closed. Admiralty Q1515; NGA 25452. Date unknown. Active; focal plane about 22 m (72 ft); green flash every 5 s. Approx. 20 m (66 ft) square skeletal tower with gallery, painted green, mounted on a square concrete base supported by piles. Jim Smith's photo is at right, Rudi Hamdani has a street view and Google has a satellite view. NGA calls this the Paotere light and lists its height as 8 m (26 ft). The current light replaced a skeletal tower about 14 m (46 ft) high. Located at the end of the west breakwater of the Paotere fishing harbor on the north side of Makassar. Accessible by walking the pier. Site open, tower closed. Admiralty Q1510.5; NGA 25458. Date unknown. Active; focal plane about 20 m (66 ft); red flash every 5 s. Approx. 14 m (46 ft) square skeletal tower with gallery, painted red, mounted on a square concrete base supported by piles. No photo available but Google has a satellite view. Located just off the end of the east breakwater of the Paotere fishing harbor. Accessible only by boat. Site open, tower closed. Admiralty Q1510.43. Date unknown. Active; focal plane about 16 m (52 ft); light characteristic unknown. Approx. 14 m (46 ft) square white skeletal tower. Fer Raintung has a photo but the tower is inconspicuous in Google's satellite view. Located on the pier at Maccini Baji, a small port about 35 km (22 mi) north of Makassar. Site open, tower closed. Date unknown. Active; focal plane 24 m (79 ft); white flash every 5 s. 20 m (66 ft) square white skeletal tower with gallery mounted on a concrete platform supported by piles. Muhammad Gaus has a 2018 photo and Google has a satellite view. Gorongkong is the site of a large cement plant. Located beside the pier at Gorongkong. Site status unknown. Admiralty Q1506.7. Date unknown. Active; focal plane 14 m (46 ft); red flash every 5 s. 14 m (46 ft) square white skeletal tower with gallery mounted on a concrete platform supported by piles. No photo but Google has a satellite view. Parepare is a seaport with about 130,000 residents about 155 km (96 mi) north of Makassar. Located on a reef about 250 m (0.15 mi) off the north side of the entrance to Parepare Bay. Accessible only by boat. Site open, tower closed. Admiralty Q1506; NGA 25476. Note: The Spermonde Islands include some 120 islands and sandy reefs in the Strait of Makassar northwest of Makassar City. Date unknown. Active; focal plane 24 m (79 ft); white flash every 10 s. 20 m (66 ft) round white concrete tower with 8 ribs, lantern and gallery. A photo (a little over halfway down the page) is available and Bing has a satellite view. Located on an islet about 40 km (25 mi) northwest of Makassar (the outermost of a large group of small islands). Accessible only by boat. Site status unknown. Admiralty Q1508.5; NGA 25461. Date unknown. Active; focal plane 15 m (49 ft); green flash every 4 s. 15 m (49 ft) square skeletal tower, painted white and mounted on a platform supported by piles. No photo available but Google has a satellite view. Located on a shoal about 20 km (13 mi) north of Makassar. Accessible only by boat. Site open, tower closed. Admiralty Q1510; NGA 25460. Date unknown. Active; focal plane 15 m (49 ft); red flash every 3 s. 15 m (49 ft) square skeletal tower, painted white and mounted on a platform supported by piles. No photo available but Bing has a satellite view. Located on a shoal about 10 km (6 mi) north of the Bone Penambungan light. Accessible only by boat. Site open, tower closed. Admiralty Q1509.5; NGA 25464. 1906. Inactive since 1957. Approx. 25 m (82 ft) cast iron tower with lantern and gallery, painted white. Andika Ferial's view from the sea at right shows this historic Dutch lighthouse and its modern replacement. 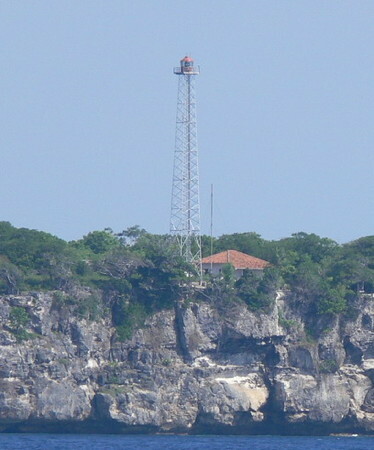 This important light station marks the westernmost of the Spermonde Islands and reefs in the southeastern quadrant of the Makassar Strait. Site open, tower closed. 1957 (station established 1906). Active; focal plane 36 m (118 ft); white flash every 5 s. 33 m (108 ft) skeletal tower with lantern and gallery, painted red (?). Several coast guard station buildings. Andika Ferial's view from the sea is at right, S. Budiarto has a very distant photo, and Bing has an indistinct satellite view of the station. Kapoposang is a popular destination for scuba divers. Located at the west point of an island in the Makassar Strait, about 100 km (60 mi) northwest of Makassar in southwestern Sulawesi. Accessible only by boat. Site open, tower closed. ARLHS IDO-022; Admiralty Q1508; NGA 25468. 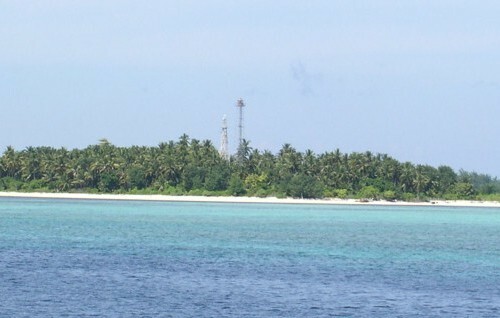 Note: These lighthouses are on reefs partially obstructing the southern entrance to the Strait of Makassar. Date unknown. Active; focal plane 44 m (144 ft); four white flashes every 30 s. 40 m (131 ft) square tapered skeletal tower with lantern and gallery, painted white. Taufik Hidayatullah's closeup photo is at the top of this page, he also has a view from the sea, and Google has a satellite view. Located at the north end of a small but inhabited island in the middle of the south entrance to the Makassar Strait, about 180 km (110 mi) west of Makassar. Accessible only by boat. Site status unknown. ARLHS IDO-139; Admiralty Q1442.7; NGA 24982. Date unknown. Active; focal plane 15 m (49 ft); white flash every 5 s. 15 m (49 ft) square skeletal tower, painted white and mounted on a platform supported by piles. No photo available but Bing has a satellite view. Located on a shoal about 10 km (6 mi) north of the Bone Penambungan light. Accessible only by boat. Site open, tower closed. Admiralty Q1509; NGA 25425. Date unknown. Active; focal plane 33 m (108 ft); white flash every 5 s. 30 m (98 ft) white iron skeletal tower. Several coast guard station buildings. No photo available but Google has a satellite view of the station. Located on the north end of a small island about 105 km (65 mi) west southwest of Makassar. Accessible only by boat. Site status unknown. ARLHS IDO-125; Admiralty Q1522; NGA 25420. Date unknown. Active; focal plane 15 m (49 ft); white flash every 5 s. 14 m (46 ft) square skeletal tower painted white. No photo available and Google has only a fuzzy satellite view of the location. Located near the south end of an uninhabited island about 20 km (13 mi) east of Dewakang Besar. Accessible only by boat. Site status unknown. Admiralty Q1523; NGA 25423. 1887. Active; focal plane 25 m (82 ft); white flash every 10 s. 23 m (75 ft) octagonal cast iron tower with lantern and three galleries, painted with red and white horizontal stripes. Damien Loong's photo is at right, Lightphotos.net has a historic closeup photo, the Amsterdam Tropenmuseum has a 1929 distant view, and a fuzzy spot marks the lighthouse in Google's fuzzy satellite view of the reef. This is the only survivor among several lighthouses of this class built in the Dutch Indies. Located at the south end of a reef in the Flores Sea about 120 km (75 mi) south southwest of the southern point of Sulawesi. Accessible only by boat; fishing tours to the reef are available. Site status unknown. ARLHS IDO-009; Admiralty Q1524; NGA 25416. Note: The Sabalana islands comprise an atoll in the Flores Sea far to the southwest of Sulawesi. They are administered as part of the Pangkajene Dan Kepulauan (Pangkajene and Islands) Regency. Date unknown (station established 1913). Active; focal plane 32 m (105 ft); two white lights every 5 s. Approx. 27 m (89 ft) "white beacon." No photo available but Google has an indistinct satellite view. The original lighthouse had a focal plane height of 20 m (66 ft). Located on a small island on the east side of the Sabalana atoll, in the middle of the Flores Sea about 150 km (90 mi) south of the southern point of Sulawesi. Accessible only by boat. Site status unknown. Admiralty Q1325; NGA 25416.5. Date unknown. Active; focal plane 17 m (56 ft); white flash every 5 s. NGA describes this as a 10 m (33 ft) fiberglass tower, but two very distant views (no longer online) suggest a taller, possibly skeletal tower. No photo available but Google has a satellite view. Located on a small island at the north end of the Sabalana Islands about 210 km (130 mi) south southwest of Makassar and 65 km (40 mi) northwest of Banawaja. Accessible only by boat. Site status unknown. Admiralty Q1325.3; NGA 25416.6. Date unknown. Active; focal plane 32 m (105 ft); white flash every 5 s. Approx. 30 m (98 ft) square skeletal tower with gallery, painted white. No photo available but Bing has a satellite view. Located on a small inhabited island on the northwest side of the Sabalana atoll about 80 km (50 mi) west southwest of Pulau Jailamu. Accessible only by boat. Site status unknown. Admiralty Q1325.5; NGA 25416.7. Date unknown. Active; focal plane about 16 m (52 ft); lightcharacteristic unknown. Approx. 16 m (52 ft) square skeletal tower mounted on a platform supported by piles. No photo available but Bing has a satellite view. Located off the southern tip of Pulau Serege, a small island on the southt side of the Sabalana atoll. Accessible only by boat. Site status unknown. Admiralty Q1324.5; NGA 25586. Note: The Tengah islands are scattered to the southwest of the Sabalana Islands; they are quite far away from Sulawesi and rather close to Sumbawa in teh Leaser Sunda Islands. They are administered as part of the Pangkajene Dan Kepulauan (Pangkajene and Islands) Regency. 1996. Active (? ); focal plane 34 m (112 ft); white flash every 10 s. 30 m (98 ft) white concrete tower with lantern and gallery. A photo is at right and Google has a satellite view. In November 2016 residents were complaining that the lighthouse had been out of service for at least a year. Located on a small island of the Tengah group, far across the Java Sea, roughly 360 km (225 mi) southwest of Makassar and only 80 km (50 mi) off the north coast of Lombok in the Lesser Sunda Islands. Accessible only by boat. Site status unknown. ARLHS IDO-203; Admiralty Q1322; NGA 25578. Fort Rotterdam (1861-1930s), Makassar. The Netherlands Archives has a closeup historic photo, Wikimedia has four historic photos from the Amsterdam Tropenmuseum, and Klaus Huelse has a distant postcard view of the lost lighthouse. 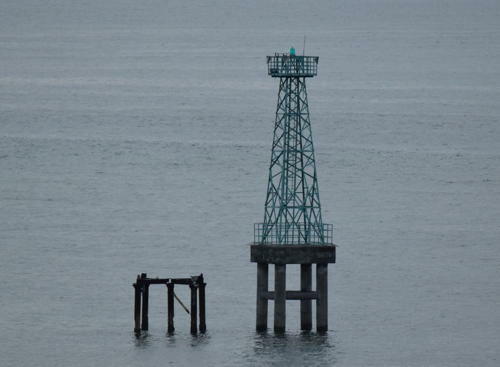 Sadly, nothing remains of this historic lighthouse. ARLHS IDO-365. Posted December 18, 2008. Checked and revised March 22, 2019. Lighthouses: 52. Site copyright 2019 Russ Rowlett and the University of North Carolina at Chapel Hill.